It also features the names of other cities from Bombay to Rio de Janeiro, indicating the moment of solar midday for them. On the right, the cities of Madrid, London, Paris and Rotterdam can be seen adjacent to the gnomon. 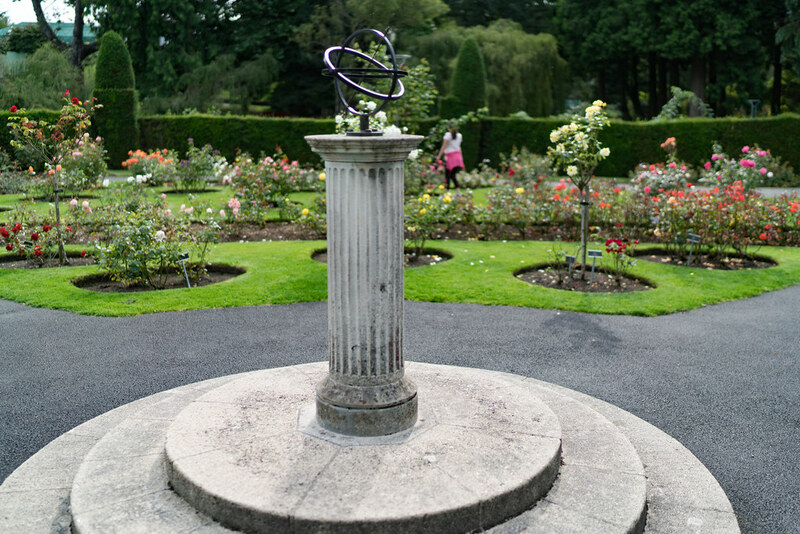 Across the Tolka river, in the Rose Garden, is a modern, armillary type dial [featured in this photograph]. The arrow points directly at the North star - Polaris. As the sun crosses the sky it casts a shadow from the shaft of the arrow on the inside of the ring that represents the equatorial line of the earth, giving the hour of the day. The shadow cast by this equatorial band against the ring supporting the arrow indicates the progression between the Solstice dates (Midwinter and Midsummer days) through the Equinox (Spring and Autumn).